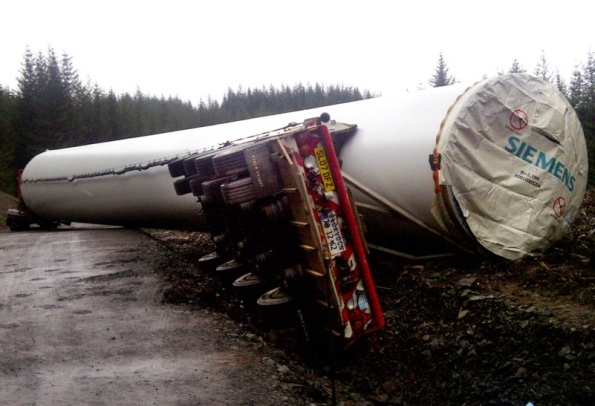 A lorry carrying a massive section of wind turbine ended up in a roadside ditch in West Argyll where rescuers struggled to remove it. The articulated vehicle was leaving the Carraig Gheal windfarm at Loch Awe when it went off the C30 road and became stuck. No-one was injured in the incident and Siemens, the company behind the site, apologised for any inconvenience caused and said an investigation had been launched. The wind farm is a 20 turbine project which is being developed by the Alloa-based company GreenPower (Carraig Gheal) Ltd.